NACHC currently partners with Primary Care Associations (PCAs), Health Center Controlled Networks (HCCNs), health centers, and other organizations to address key clinical issues facing health centers. Recent projects have been supported by the Health Resources & Services Administration’s Bureau of Primary Health Care, the Centers for Disease Control and Prevention, DentaQuest Foundation, A.T. Still University, the American Academy of Addiction Psychiatry and the Denver Health and Hospital Authority. 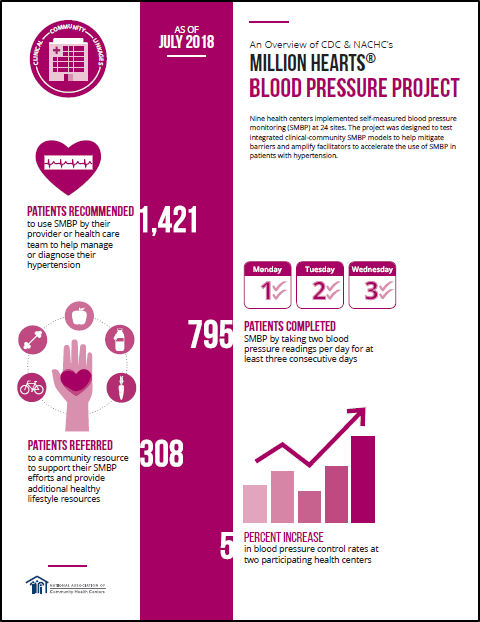 In the past year, NACHC has invested over $4.6 million In clinical projects in the health center field, worked with 152 different community health centers in 38 states and with 23 different PCAs and HCCNs. Investing in information technology and quality improvement infrastructure at health centers remains a high priority. NACHC’s clinical projects are guided by internal and external subject experts and currently include pilot models, proofs of concept, prototypes, and learning communities. NACHC is working to improve the delivery of adult influenza and routine vaccination services and reduce vaccination services disparities among underserved adult populations by increasing implementation of the Standards for Adult Immunization Practice at health centers that currently offer adult vaccination services. NACHC’s cancer screening projects aim to advance and scale a cancer screening transformation approach developed through previous CDC-funded work to improve colorectal and cervical cancer screening in health centers. This project will synthesize actionable findings from the pilot, develop a technical package for broad use, support implementation, disseminate technical package for national spread, and scale and evaluate implementation experience. NACHC aims to use a multi-pronged approach to achieve positive impacts on two key Million Hearts® 2022 goals: optimizing care that prevents heart attacks and strokes and improving cardiovascular health outcomes for priority populations. Improving Identification and Diagnosis of Hypertensive Patients Hiding in Plain Sight (HIPS) in Health Centers examines the use of algorithmic logic for identifying patients with possible undiagnosed hypertension to improve hypertension detection and diagnosis in health centers. The Health Care Delivery SMBP Implementation Guide is designed to help health care delivery organizations implement SMBP into practice or optimize existing SMBP processes. This project endeavors to advance Hepatitis B and Hepatitis C integration in primary care and implementation of the National Viral Hepatitis Action Plan 2017- 2020. NACHC is working work with CVS Health to integrate addiction medicine into primary care. 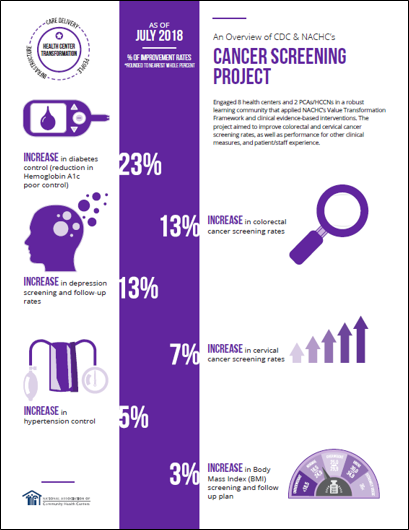 “Innovative Approaches for Prescription Drug Abuse Management and Prevention” is a 12-month learning community designed to help health centers build capacity for providing integrated behavioral health services in communities with high incidence of substance use and abuse. To date, there have been two cohorts. 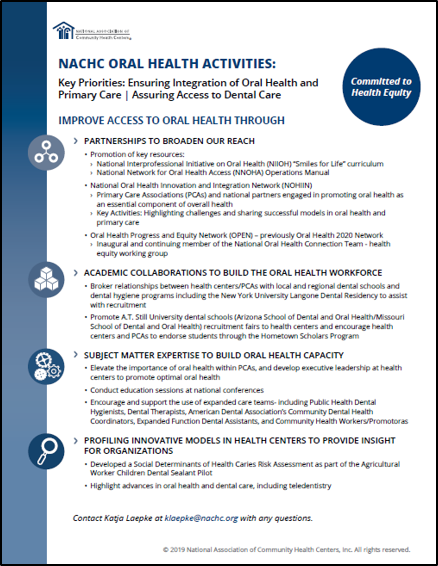 NACHC is working to ensure the integration of oral health and primary care and to improve access to oral health through partnerships and academic collaborations to build the oral health workforce, the use of subject matter expertise to build oral health capacity, and by profiling innovative models in health centers. As part of the Agricultural Worker Children Dental Sealant Pilot, NACHC developed a Social Determinants of Health Caries Risk Assessment. In partnership with the Healthy Weight Partnership, NACHC is implementing the Mind, Exercise, Nutrition, Do It! (MEND) 7-13 Program with 16 health centers in 5 states. The project aims to improve health outcomes for children aged 7-13 with obesity or who are overweight and at risk for obesity. NACHC is working to build the capacity of health centers to screen, refer, track, and follow-up with women with gestational diabetes mellitus (GDM), including the design of a model to increase postpartum screening and counseling and dissemination of evidence-based prevention and management guidelines. In Year 1, NACHC will design a model and strategy to improve diabetes control among GDM-affected pregnancies by increasing postpartum diabetes screening, increasing postpartum contraception counseling, and building capacity for the use of evidence-based interventions. Years 2-5 of the project, if funded, will focus on implementation and scale. Current projects aim to advance contraception practice guideline adoption in health centers and support providers in facilitating patient-centered care and making evidence-based decisions, leading to improved access to and use of contraception and lower rates of unintended pregnancy. Methods will include validation of current quality measures to look at the ways that contraceptive care is being delivered at community health centers and enhancing access to current contraception practice guidelines by providers and their teams. 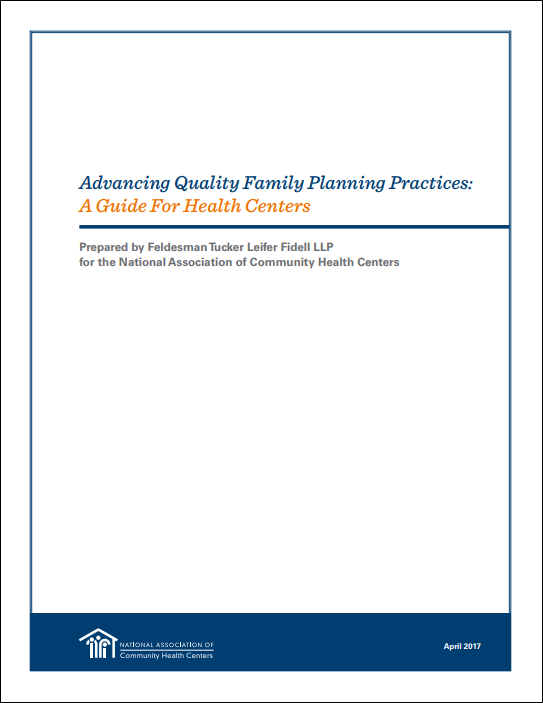 Advancing Quality Family Planning Practices: A Guide For Health Centers provides guidance to health centers wishing to expand and improve access to quality family planning and reproductive health services in their community.